The 2018/2019 Lange RX 130 LV was tested in the men’s All-Mountain narrow category at Silver Mountain Resort by the experts at America's Best Bootfitters, powered by Masterfit. Last year one tester called it $850 worth of skiing perfection and this year he said the 2019 Lange RX 130 LV feels like a real 97 in a sea of fake 98’s! The rest of the test team agreed with him on both points, and put this one near the tippy top of the highly competitive narrow All-Mountain category for its flawless combination of close-but-contoured fit with dominant downhill performance. Virtually every tester said they could make this their daily driver in a heartbeat—and they liked the new, darker look this year. Some testers described the fit of the RX 130 LV as, just like the frontside RS 130 but tighter, (duh, right?). 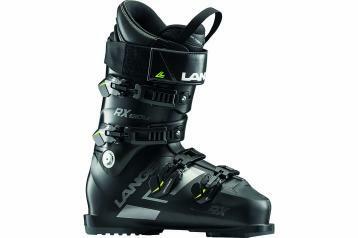 Others said that at first the RX LV didn't feel tight-enough but then once they skied it they realized that it was just that it was so well-shaped that none of their bony spots were barking at them—it didn't ski loose, they explained. The new shell shape and liner shape are well-contoured to the foot and leg, and the two are well-matched to each other, with minimal tolerances between the exterior of the liner and the interior of the shell—no foot shearing or gappy feel here, testers claimed. Cuff height, shin fit and calf fit all got "ideal" marks. Take a few laps through the race course, hammer a zipper line, grab a fatty and bury yourself in pow— testers said the RX 130 LV is the driver of choice for all those applications. Testers affirmed that the RX 130 LV has tons of brute strength on edge, at speed, but without sacrificing quickness. Which was better, its power or quickness? Dead heat, they said—the Dual Core shell and cuff construction utilizes a unique plastic injection method that creates a dual-density shell wall intended to give the boot a more lively, elastic feel. Testers reported again that it ain't just marketing mumbo jumbo—as proof, quickness and agility scores were through the roof. We think it's cool that a performance-oriented guy with a medium foot could stuff himself in here with some clean bootwork, thanks to the mono-injected polyether shell and cuff that makes grinds and stretches easy. GripWalk soles can be swapped on here if you're into that—gotta have a GripWalk compatible binding with those. Testers like the simple, Velcro power strap and single-side, set-screw-style cuff adjustment. Dual Core polyether/Dual Core polyether/n.a.